Today, I interview DC Scarpelli who will be playing the role of The Emperor in The Song of the Nightingale. DC is one of the most talented, creative and intelligent individuals I know - though his humility might protest otherwise. It is an honor to have him as my Emperor. MIN: Tell me a bit about your performance background. DC: Let's see…. I was one of those kids who hit musical theater geekdom early. It was essentially my version of puberty (the other version of puberty being pretty distasteful and, frankly, disastrous). In middle school, I knew the whole Rodgers and Hammerstein canon backward and forward (Things like Pipe Dream and Me and Juliet have subsequently slipped my mind). I hit major Sondheim geekdom in 8th grade or so, and never looked back. I got my BA in theater at Yale (concentrating on playwrighting), but the real theater boot camp was performing with The Purple Crayon, Yale's oldest improv group. That gave me four years of INTENSE improvisational theater training which has served me every single day of my life since -- onstage and off. It also gave me my amazing husband, Peter Budinger, who's been my writing partner, theatrical collaborator and significantly better half for twenty years. DC and his husband Peter sharing the stage. M: And what about outside of theater? DC: Outside of theater, I'd always had an aptitude for design, and in 2003 I got a BFA from the Academy of Art University in San Francisco. Spent a bunch of years designing, and went back to the AAU to teach. I'm now the Design Lead for their School of Web Design + New Media. My concentration is in visual design, typography and type design. I love letters. And I love passing on that love to others. M: You actually designed the logo for The Song of the Nightingale. How long have you been working in graphic design/typography, etc? Do you find "cross-inspiration" between your work with visual design and your work as a performer? Do they inform each other at all? DC: I'd say that love of theater and storytelling inform my design work far more than my designs inform my stagework. Growing up, I had an obsession for theatrical art and illustration. Listening to cast albums while staring at the jacket art really makes you see the connections between a show and its design. The theater poster has always been an amazing thing to me -- a visual distillation of an entire show into one image. Think of Al Hirschfeld's marionette caricature of God/Shaw manipulating Rex Harrison manipulating Julie Andrews or Saul Bass's gritty fire escape design for West Side Story. As a little kid in the late '70s and '80s, there were lots of theatrical graphic designers that had a signature look. That really left its mark on me. 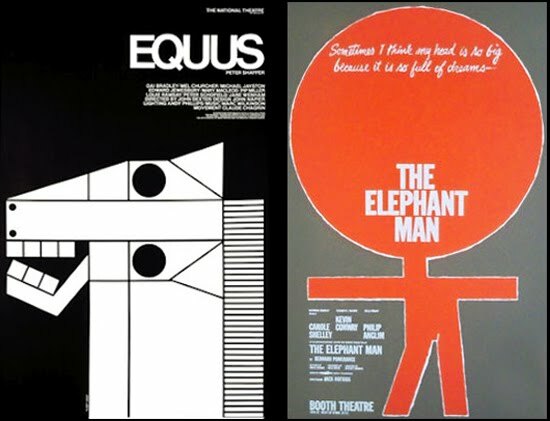 Gilbert Lesser's posters are iconic — just stark type and geometry (Equus, The Elephant Man…). 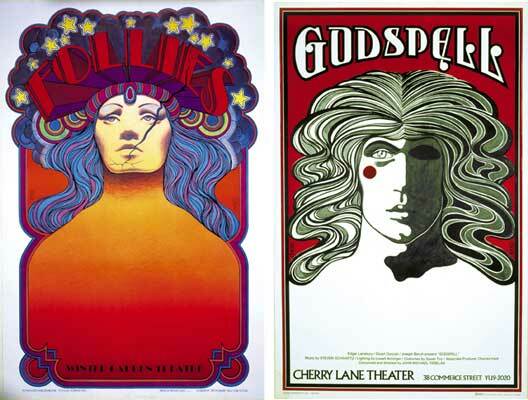 David Edward Byrd's posters were amazing (Godspell, Follies...). But James McMullen's posters for Lincoln Center Theater are masterpieces. He's the most long-lived resident artist at any theater company, and his works are absolute wonders, capturing the essence of each show (Anything Goes, A Delicate Balance, Carousel… dozens of others…). In the late '80s, when Cameron Mackintosh took over Broadway, posters drifted toward corporate branding (Phantom, Cats, Les Miz...), which has its own kind of storytelling behind it. I always thought to myself that theatrical illustration seemed like such a wonderful thing to do — capturing the essence of an experience and putting a face on it. And it offered infinite variety. How could you not love that? It don't pay the bills, but it's a labor of love. M: What draws you to playing the role of the Emperor? DC: Oh, there's absolutely NOTHING as fun as playing someone who's essentially a child. That's what theater is about, right? Returning to a sense of play and pretend? Well, the Emperor's just an overindulged, overindulgent little kid who likes shiny things and always wants his way. All the best villains are just overgrown children with moustaches to twirl. But this one gets to grow up and be a man, too. Big plus. M: Anything else you'd like to add? DC: I will add one thing: Doing new work is one of the most thrilling things we get to do in the theater, and we don't do enough of it. We need to take chances more as creators. We need to embrace the new. Doing six thousand productions of Dolly or Seussical or Urinetown is just fine, but helping to birth an entirely new experience for theatergoers? Wow! What a gift! Thanks for this, Min. We need more of you in the world. I hope someday people are listening to your work while staring at the album cover, amazed. M: Thank YOU, DC. It's hard to imagine anyone else playing the Emperor for this show. I'll see you at rehearsal. Posted on September 30, 2013 by Min Kahng and filed under Creative, Performing Arts and tagged The Song of the Nightingale DC Scarpelli interview.